Lucky cow! 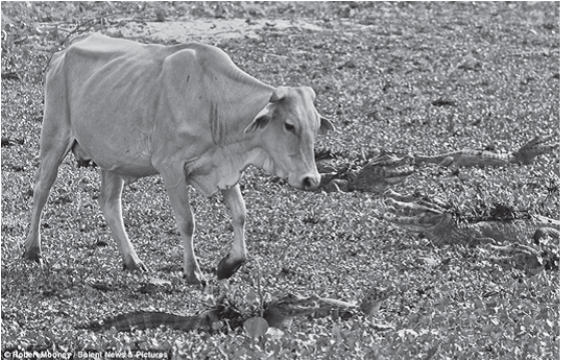 This daring Brazilian cow was spotted moving around fearlessly among crocodiles in search of some tasty treats. Crocodiles, a whole bunch of them, simply looked at her with their mouths wide open, may be in disbelief at her audacity. Showing the confidence of a catwalk model, but may be with more than a hint of udder idiocy, the barmy Brazilian bovine avoided stepping on the crocs in her search for a good meal. This brave moo was lucky, the only snap she suffered when wandering into a field full of carnivores was from a camera. Photographer Robert Mooney, of Arlington, Virginia, took the incredible photograph on the tropical Pantanal swamps in the western state of Mato Grosso. At the time of report it was not know if she had befriended the colony of crocodiles. The Pantanal is the world’s largest wetland area - covering 88,803 square miles - an area nearly the same size as Scotland. It stretches to Paraguay in the south, Bolivia in the west, and is home to more than 3,500 species of plants, 650 different kinds of bird and 400 species of fish. Come to the spiritual platform, brahma-bhutah prasannatma na socati na... [Bg. 18.54], samah sarvesu bhutesu. Then you can see equally. Otherwise you will see that “I have become human being. I have got my hands and legs, and the poor cow has no hands and legs. I have soul and she has no soul. Kill her and eat.” No. Samah sarvesu bhutesu. Asamata. Unequality. Why? What right you have got to kill another animal? Because you have no vision of equality, for want of Krsna consciousness. Therefore so-called education, culture, fraternity, in this material world, all these are bogus, humbug.